Paulie has been studying the skeletal system in the last couple of weeks of school. He brought home his pasta model, labeled with correct bone names, the other day. What a fun way to create the skeleton in a manner that will hopefully aid his remembering the various names! Elizabeth has been charged, in this last full week of school, with making a math-themed board game to share with her classmates. 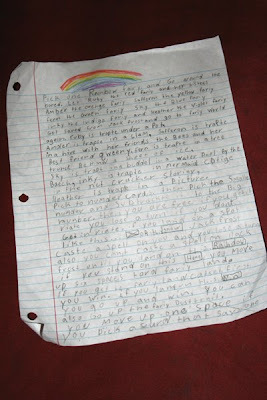 The first step of the process was writing down all the rules of the game. She has been diligently working for the last several evenings on Magical Fairy Math, the game she created, which is centered around the fairy characters from the Rainbow Magic book series. I'll try to post the board and characters when she's finished with them. That's so funny....Eli is really into skeleton stuff right now and wants to learn all about the body, so I have been looking for skeleton crafts or activities he could do and that one came up for us! Oh my gosh.....I LOVE the pasta skeleton. I will have to keep that in mind when Kayla gets there in schooling. You have so much to be proud of! 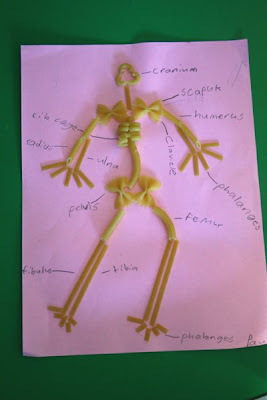 My son would love to try making a skeleton like that...what a great idea to use pasta. It looks like Elizabeth put a lot of detail and hard work into her game; I'm sure it will be fun. The violin recital was so cute. That skeleton is very cool! Can't wait to see the finished board game. It sounds like a lovely game she is planning! What a fun idea to use the pasta like this!